I stopped bringing babies into the world some time ago. Fine. It was like five years ago. But that doesn't mean I can't celebrate the miraculous feat that is motherhood. If someone at work has decided to commit the hubris of bringing a life into this world, the least I can do is make cookies. This baby shower was black and white all over, with pops of pink. Classy meets floral. Or something like that. 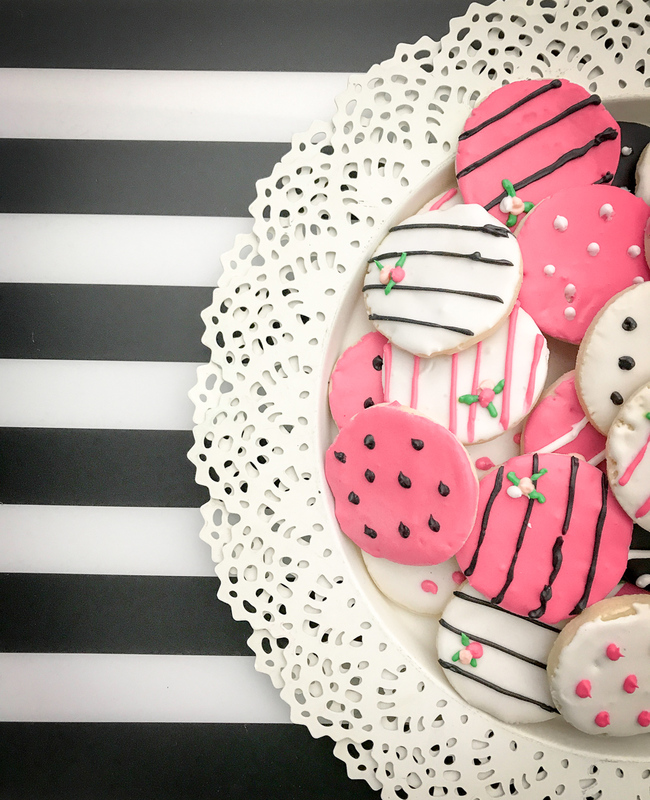 I started off by making these soft, thick sour scream sugar cookies bedecked with pinstripes and polka dots. Accented by tiny flowers and arranged artfully on a tray, they were like cookie versions of swanky petit fours. They were joined by something sweet, salty, and vegan to satisfy the abstainers in the room. Cashew Tiger Butter is exactly what it sounds like. Cashew and chocolate, swirled together and hardened, then broken off into chunks. In addition to some old-fashioned pink lemonade, I wanted my colleagues to have a sip. I went with this White Cosmo, substituting simple syrup for the cranberry juice and adorning with an edible, organic pink rose petal. Next time you're looking to class up the joint, I highly recommend a little black and white and pink all over. Congratulations to expectant parents everywhere. May sleep someday find you again with your sanity still intact. For more swanky party ideas, visit A Sweet Little Life on Pinterest. Five Best Foodie Blogs. EVER.